NY Fashion Week kicked off yesterday, and my most favourite thing about it was designers Christopher Kunz and Nicholas Kunz sharing the limelight with this gorgeous poochy at the Nicholas K show! I absolutely adore all doggies and I absolutely adore fashion, so this to me is the perfect start! 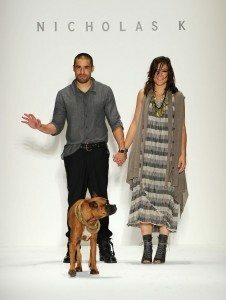 (Not that dogs and fashion always go well together – remember Carrie, Pete and the chewed Manolo in SATC? Aaaaah!). Christopher Kunz and Nicholas Kunz following the Nicholas K Spring Summer 2011 show at Mercedes Benz Fashion Week, held at the Lincoln Center, New York City. Image: Frazer Harrison / Getty Images for Mercedes Benz.